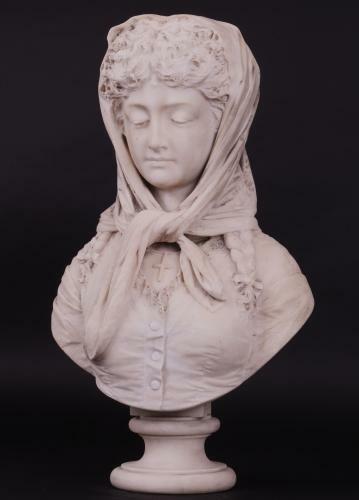 An exquisitely carved 19th Century Italian marble bust of a young lady by Antonio Argenti. This piece reflects the intricate artistic design and the attention to detail is incredible, from the stitching & buttons to the absolutely wonderfully sculptured pleated darts in the dress and also the delicate lacework. This piece is signed Argenti Antonio, Milano & dates to around 1878-1880, he was supremely skilled & one of the leading Italian marble sculptors of the period. This marble portrait sculpture is in excellent, original untouched condition for age. Antonio Argenti ( 1845 - 1916 ) was born in Varese, Italy and studied at the Milan Academy, before exhibiting his marbles at the Expositions in Naples, Rome, Venice and Milan.